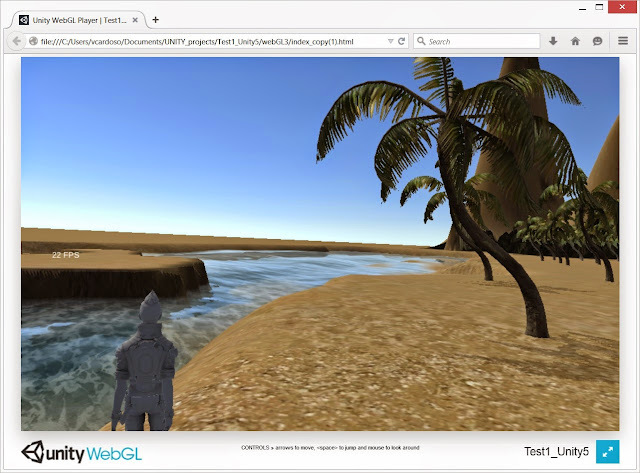 Unity 5.0 WebGL scenes are really cool and quite fast ... running without plugins and, as far as I could observe, with less trouble than the builds for the previous Unity Web plugin (which had some annoying issues like shadows sometimes not displaying). The generated WebGL code may look huge at first sight but that impression is somehow wrong because inside the build folder there is one compressed version and one uncompressed. Your server will, most probably, use the uncompressed which is several times smaller. Below is a WebGL version created for the revised easy scene tutorial. It runs directly on the browser (on Chrome also runs well, but for better performance use Firefox as advised by Unity) and does not need a dedicated graphics card. On a standard intel graphics card (HD 4600, on my laptop) runs with fair performance. The fps counter floated from 12 fps to more than 50 fps on less demanding parts of this scene. This scene has a few more elements not covered in this first tutorial (a pond with obstacles to test the new default avatar and special water mirroring the environment, now available in Unity3D free version) and may take some time to load depending on your available bandwidth. The browser cache will reduce it the next time you load the scene. Hello everyone, in my case was already developing a scenario in version 4 and had to make a code migration to version 5.0.1. It has become complicated because the scripts in the scenario were all rebuilt during the upgrade, I had to re-import the assets being careful not keep garbage from the previous version. For those who will start a scenario it is best to delete / uninstall version 4.6, reinstall the new already in the new upgrade and do it again download of the assets. I leave here my version, not yet checked the skybox and lighting, introduced the "water4 simple" and tested the navigation with the avatars: firstperson controller, simple thirdperson controller without zoom and again thirdperson controller with zoom with the mouse scrool. During the experience simply press the keys 1, 2 or 3 to switch the types of navigation. I would appreciate feedback of your favorite types of navigation and suggestions to improve. It is a promising scene. Liked the terrain design and the interactive objects with a backpack functionality. Concerning navigation I normally prefer third person view bit it is nice to have all modes available. Noticed some black spots in the skybox. You probably converted it from the former Unity 4. Replace it by a new one for Unity 5. There are several free at Unity's asset store. There is 3 avatar navigation mode implemented in this project, change pressing numeric keys 1,2 or 3. I have a huge problem the webgl files have 190Mb and the project is in the beggining, any ideias to reduce the size? a) enthusiastic and interesting, because the subject is simply fantastic: present in all domains of human activity, and with increasing social acceptance. As a conclusion, the experience was extremely positive and allowed me to access a new world of possibilities and applications, both personal and professional. Without any doubt, this an option for the future.